The weight of evidence, official and unofficial, direct and collateral, goes to substantiate the claim of Philadelphia to be the mother-city of Masonry in America. We do not know the date or the circumstances of the formation of the first lodge, but it is reasonably inferred that some of the brethren, who had been initiated in England or elsewhere, met together more than a century and a half ago in this city, and resolved to establish an organization. It is, however, positive that, on June 5, 1730, the Duke of Norfolk, Grand Master of the Grand Lodge of England, issued a deputation to Daniel Cox (sometimes spelled Daniel Coxe), of New Jersey, as Provincial Grand Master of the provinces of New York, New Jersey, and Pennsylvania. This document speaks of application having been made by residents in the provinces, which proves that prior to 1730 there were Masons in Philadelphia. Moreover, Benjamin Franklin, in his Pennsylvania Gazette, of Dec. 8, 1730, said there were then several lodges of Freemasons erected in the provinces. Thomas Cadwalader’s letter of Nov. 17, 1754, to Henry Bell, of Lancaster, has an allusion to first Masonic lodge in Philadelphia, which was sometimes opened by a party that met at the Tun Tavern in Water Street. In the fall of 1730 they planned to obtain a charter from the Grand Lodge of England, but with Grand Master Cox coming into office, they procured it from him. 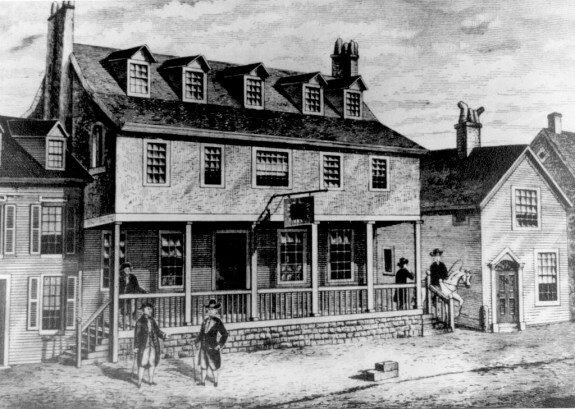 On St. John’s day, June, 1732, a Grand Lodge was held at the Tun Tavern. At that Lodge W. Allen was chosen Grand Master, William Pringle, Deputy Master, and Thomas Boude and Benjamin Franklin, Wardens, for the following year. The notice of this meeting in the Pennsylvania Gazette says “Sun Tavern,” — an obvious misprint, as the most diligent search has failed to discover any such establishment. The Tun Tavern was kept by Thomas Mullan, and was on the east side of the street then indifferently called Water Street or King Street. The lodge, which before and after the Revolution was “No. 3,” bore the additional title of Tun Lodge, an unquestionable allusion to the place of its origin. In 1734, Dr. Franklin, then Grand Master of the province of Pennsylvania, had some correspondence with Henry Price, Grand Master of England, Provincial Grand Master of New England and dominions and territories. Franklin’s letter bore the date Nov. 28, 1734, and in it he said that as he had heard that “Mr. Price’s deputation and power were extended over all America,” the brethren in Pennsylvania requested from him a charter confirming them in their privileges of holding a Grand Lodge. Eventually, the members wearied of meeting in taverns and in 1752 they resolved to erect a separate building for Masonic purposes. It was finished in 1754, and was a three-story brick building on the south side of Norris (eventually renamed Lodge) Alley, just west of Second Street. The Sword Bearer carrying a drawn sword. Six Stewards with white rods, walking two-and-two. The Grand Secretary and Grand Treasurer, who bore each a crimson damask cushion, on one of which was laid the Bible, and on the other the Book of Constitutions. The Grand Master, supported by two brethren of rank and distinction. The Deputy Grand Master, supported in like manner. Two members of the Grand Lodge. The three orders, Doric, Ionic, and Corinthian, carried by three Tylers. The three Masters of the three regular lodges of the city. The two Wardens of the First Lodge. The two Wardens of the Second Lodge. The two Wardens of the Third Lodge. The three Secretaries of the three lodges. The three Treasurers of the three lodges. The visiting brethren walking two-and-two. The members of the First, Second, and Third Lodges walking two-and-two. The six Stewards with their rods, walking two-and-two. Canons thundered their salutes and a curious populace gazed upon the panoply and display as the line marched to the church and returned to the hall. There a banquet had been prepared, which the Masons and their guests enjoyed until the very modest hour of five o’clock in the afternoon. The Grand Lodge almost ceased to exist during the Revolution, the members being much divided on politics, and Grand Master Allen, who was a Royalist, having left for England. This is a highly excerpted page from History of Philadelphia 1609 – 1884. Accessible Archives subscribers can access the full chapter when logged into the database. Title: CHAPTER XLIX. Secret Orders and Societies, Page 2062. Source: History of Philadelphia 1609 – 1884.